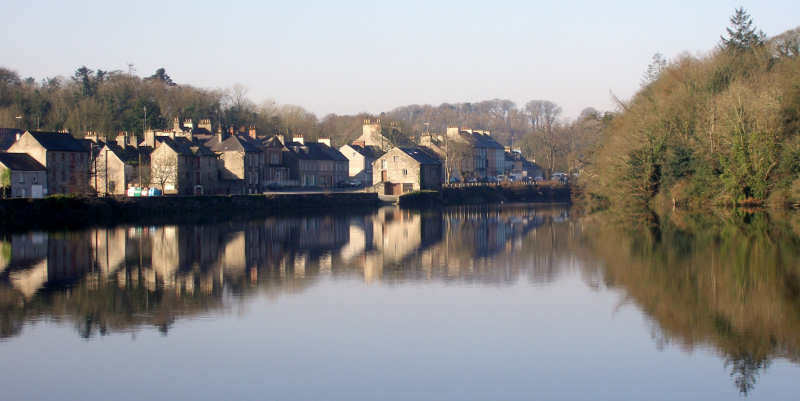 The book begins with Gallaher’s birth in 1873 into a shop-owning middle class family in a tiny seaside village in Donegal called Ramelton. His father James was 62 and his mother Anna Maria Hardy McCloskie, James’ second wife, was just 29. Dave was James and Anna Maria’s seventh child, born seven years after they married. Three of their children had died in infancy. Three more were born in Ramelton after Dave. James sold the business and cast the family fortunes in with a Tyrone-born entrepreneur named William Stewart Vessey who had bought 10,000 acres in Katikati and attracted others to join him in establishing a little piece of Ulster on the other side of the world. Two weeks after the birth of James and Anna Maria’s youngest child, the family set off on what must have been an at-times daunting journey. The newborn son was a sickly infant and so was left behind with friends. As it was, he died about two years later. The family travelled by sea, train and ferry to Belfast and set sail from there on the 17 May 1878 on the 4000-ton clipper Lady Jocelyn. The family of two adults and six young children arrived in Auckland 86 days later. From there they travelled by boat to Tauranga and again by boat to Katikati where they expected to receive the warm welcome promised by William Steward Vessey. The reality was very different. They found themselves on a small block of very rough, bracken-infested land which James, with no previous farming experience, proceeded to break in and plant with crops that failed to provide the family with a living. A stroke of fortune came their way when Anna Maria was appointed teacher at the local school. 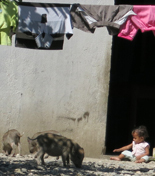 Her two pounds-per-week income enabled the growing family to survive. Four more children, including twins Henry and Charles were born in Katikati. At this time Anna Maria became ill, the family relying more and more on the the oldest boys Joseph and Thomas. As soon as he was old enough Dave left school and took a job with a local stock and station agent. He spent much of his time riding through the district and gave what money he could to his parents. When Anna Maria’s condition worsened she was moved to Auckland Hospital, where she died of cancer on 31 August 1888. Joseph meanwhile had moved to Auckland. The rest of the family soon followed and when Joseph married Nell Burchell in 1894, James and the rest of the family moved to Freemans Bay. The story of the emigration of the Gallahers (the ‘g’ in the Irish form of the name Gallagher was lost on the way) was not untypical of many of the families who braved the hardships of the lengthy sea voyage to New Zealand. Many readers of this review could share similar stories of their families. 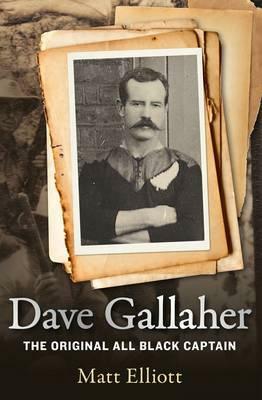 The book is scant on any further details of Dave Gallaher’s early life apart from the death of their father James in November 1894, aged 82. Like so many other migrant families, by dint of hard work, taking opportunities and amazing grit and courage, they survived. Dave went on to take up jobs in the Northern Roller Mills and later the Auckland Farmers’ Freezing Company which he held throughout his working life and combined with his increasing involvement in the newly emerging game of rugby. Elliott covers in some detail the development of the local game in Ponsonby, the provincial level in Auckland and finally the All Blacks’ emergence on the international stage when the ‘Originals’ toured England, Ireland, Scotland and Wales in 1905 and won every match apart from a highly disputed loss to Wales. A diversion to France was added at the last minute so the team played a French test at the Parc de Princes. Dave Gallaher’s reputation grew as a player of skill and an all round sportsman and athlete. He represented his province in cricket and athletics as well as rugby. His selection as captain of the 1905 touring team was the cause of some discontent due to the fact that the team had selected the captain of previous national sides. Gallaher was appointed by the NZRFU, seemingly with the influence of Premier Seddon who recognised Gallaher’s leadership skills and talents that would make him a worthy ambassador for New Zealand while touring ‘the Motherland’. Seddon’s judgement was based in part on Gallaher’s successful involvement with the New Zealand contingent that fought with distinction in the Boer War. A significant portion of the book is devoted to a detailed description of the 1905 tour. It is of interest to rugby players for a number of reasons, such as the highly fluid nature of the game – the positions of players in both forwards and backs, the number of players in the scrum and the role of referees and linesmen were not defined; and the points awarded for tries, conversions and drop goals differed markedly from the present day. It was also a gentleman’s game played in a leisurely way by men who were observed smoking a pipe or cigarette as they went onto the field of play. Shin guards were worn by players, the referee wore suit and tie, and boaters were standard head gear for the team off the field. The book describes how the name ‘All Black’ was confirmed by this tour – how they began each match with a haka and were called on to perform the haka on social occasions as well. The team’s composition reflects the social make-up of the new colonial society. 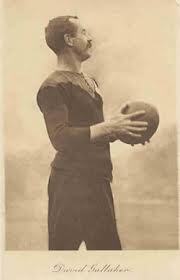 It is acknowledged that vice-captain Billy Stead was part Maori. Apart from him, the names of the rest of the team would indicate they were all from the settler population (a ‘Native’ team toured the British Isles in 1908). On the team’s return, Dave Gallaher returned to his job at the freezing works on the foreshore, walking there each day from his Ponsonby home. He met and married Nellie Francis on 10 October 1906 in All Souls Anglican Church on Ponsonby Road. They were blessed with a daughter whom they called Nora. Dave Gallaher initially played for Ponsonby and Auckland province. As rugby emerged into a dominant role in the life of the young colony and province, he took more responsible positions in administration. For many years, he was a selector for the national team as well as coach and manager of provincial, club and even schoolboy teams. All this was to change with the outbreak of the World War in 1914. Two of his brothers, Charles and Douglas, had migrated to Australia and joined the Australian expeditionary forces. Both fought at Gallipoli. Charles was sent back to Australia with injuries and Douglas died in the battle of the Somme in 1916. Their deaths did not stop Dave from volunteering, in spite of the rules preventing heads of families from enrolling. He sailed with the New Zealand contingent from Wellington on 15 February 1917. Because of his record in the Boer War he was promoted to the rank of Sergeant Major. While leading a troop of men who were totally dedicated to him because of the esteem in which they held him as a sportsman, national hero and leader, he was fatally injured at the battle of Ypres on 4 October 1917. Before he could be transported to a field hospital he died of his wounds. The proud son of Ireland and New Zealand, father, husband, unflappable captain and soldier lay dead on a foreign field. When the 2005 All Black team captained by Tana Umanga visited Ireland they were hosted in Ramelton where they visited the Letterkenny Rugby Football Club and christened the club’s grounds ‘The Dave Gallaher Memorial Park’. The club founded 100 years after his birth, sports the Gallaher name and the silver fern in its crest. When you are over this way you may care to visit Ramelton and Letterkenny, thereby paying a tribute to an outstanding Irishman, an outstanding emigrant, a survivor, a leader and a great Kiwi. If you don’t make it this far then perhaps you could find time to do visit his statue in Windsor Road (of 1981 fame) outside Eden Park. As I write this on holiday in Malta, I am resolved to visit his grave in France before the centenary of his heroic death. This entry was posted on Thursday, January 24th, 2013 at 11:07 am and is filed under Books, Heritage, Profiles, Sport. You can follow any responses to this entry through the RSS 2.0 feed. You can leave a response, or trackback from your own site.